There’s a corn soup that you need to know about before the corn goes away and, sadly, the corn’s going away pretty soon. Grab some, OK? The sweet stuff. You’re about to make a corn soup that’s so good even people who hate corn soup–CRAIG’S PARENTS–will declare it wonderful. (I didn’t know Craig’s parents hated corn soup when I made this for them…more on that in a bit.) Confession: I took beautiful pictures of this recipe and the process of making it and then lost them, somehow, on the journey from my camera to my computer. So you’re stuck with these ones from my phone, but bear with me. It’s worth it. See, if you have my cookbook you’ll recall that when I cooked with Curtis Duffy in Chicago he made a corn soup with so much fanfare, it looked like a Faberge egg with some yellow stuff underneath it. It was beautiful, a work of art: there was a coconut dome made with liquid nitrogen; there were black squiggles made with burnt corn husk oil. 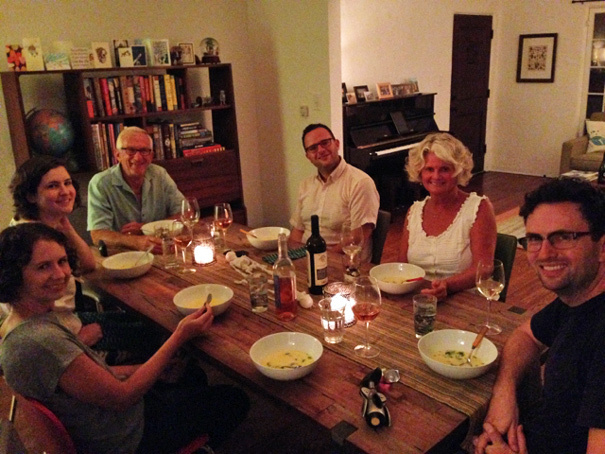 Instead of focusing on that, I focused on the soup… and the soup distilled the essence of sweet summer corn. It goes like this: by a s**t-ton of yellow corn. 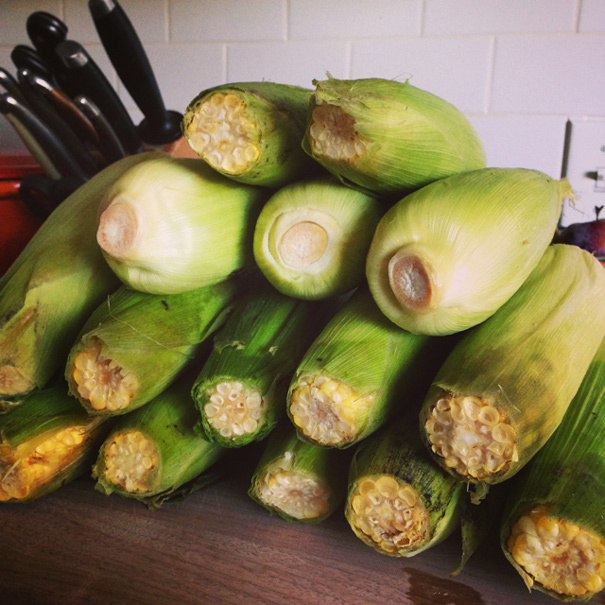 For 6 people, I bought 17 cobs. Then spend an hour husking them, and cutting the kernels off into a big bowl by balancing each cob on top of another bowl that’s turned upside-down. (See here.) When you have an insane amount of juicy, sweet, yellow corn kernels, throw them (in batches) into a big blender with enough water to make the liquid come out of the corn (about 1 cup, say). You should have a big blenderful of yellow corn mush and liquid. Strain that into a pot. Repeat with the remaining corn and then look into that pot: you basically have corn juice. You also have natural corn starch because hopefully you scraped those cobs clean. 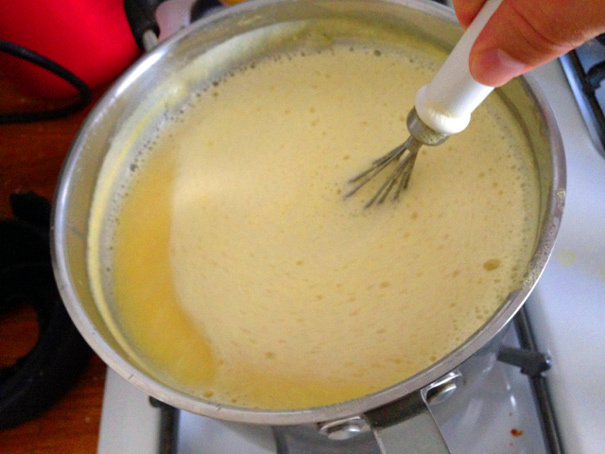 That corn starch is a natural thickener; so now crank up the heat and start whisking (that’s what’s happening in the lead picture). Be careful here because it might eventually bubble over–I had too much liquid in there, I think–but the point is, you want to cook this until it’s thick like custard. You whisk to prevent burning on the bottom of the pan. Meanwhile, you should rinse out your blender and then pour the cooked soup back into it. Add a glug of olive oil, some lime juice, and some salt and blend. 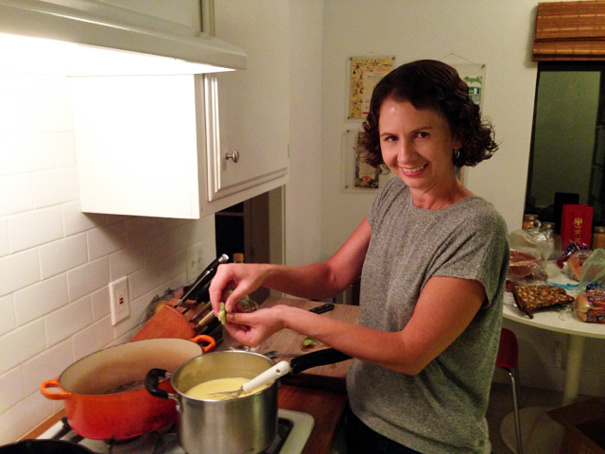 When I did this, the soup gushed out the top and I burned myself a little (two gaffes, one recipe; still an amateur). Then pour back into the pot and place in the refrigerator and chill. Like revenge, this soup tastes best cold. High praise indeed! So make this while you can because pretty soon it’ll be all butternut squash, all the time. And whatever you don’t eat, you can freeze to remind you of the summeriest summer taste in the dead of winter.